Sometimes as we age, it feels like everything we do causes illness or pushes us towards a shorter lifespan. Can’t we just enjoy our retirement years? This latest article said that too much protein can cause prostate cancer. Other articles support a high-protein diet, saying it helps slow down muscle loss, can lower the risk of hip fractures and keeps us strong. So, whose rules do we follow? Good advice is to eat a variety of foods – protein and sweets included – while maintaining portion control. Sure, if you’re eating bacon and sausage every morning, a burger every day for lunch and a steak every night for dinner, you may need to cut back on your protein intake. Otherwise, it’s important to continue eating a variety of fresh fruits, vegetables, protein, grains and foods with calcium. Colorful foods are good for your health. When you’re at the grocery store, your shopping cart should be bursting with color, from a rich green lettuce, to bright blue blueberries, to red ripened tomatoes and bright pink salmon. Bonus tip: The darker the color, the better it is for you. Focus on the real thing. While it may be easier to get your nutrients from a multi-vitamin or fruit juices, the real thing is always better for you. Get your fiber from whole fruits and grains, your Vitamin D from eggs and fatty fish and your Calcium from milk and yogurt! Be smart with carbs. Choose whole grains as opposed to white flour for more nutrients and fiber. According to experts, seniors need about 6-7 ounces of grains each day (one ounce is about 1 slice of bread). Don’t forget water. Seniors are prone to dehydration, so be sure to continually drink water throughout the day. Remember, just because coffee, juice and soda may contain water – they are not hydrating your body the same way that water will. 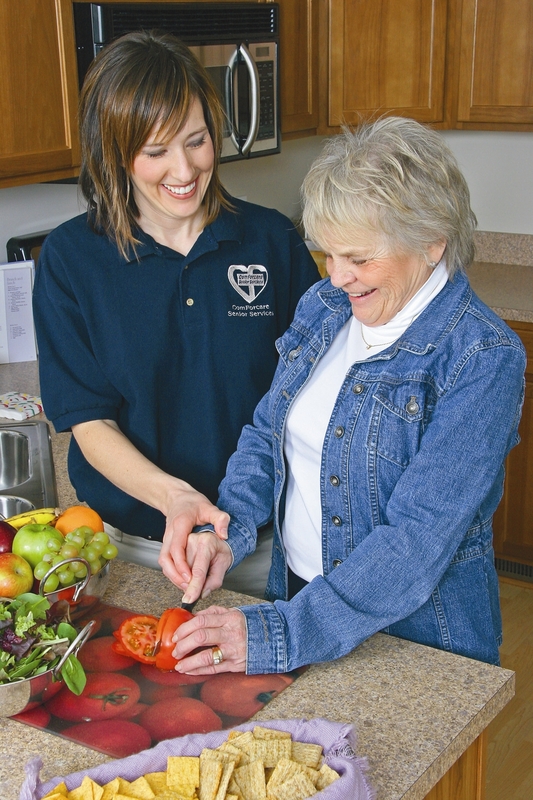 For more nutrition and diet tips for seniors, check out this article.